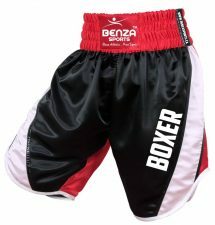 “BENZA SPORTS” produces stunning high gloss, poly satin, full-cut trunks, side cut or bottom curve boxing shorts, boxing trunks with extended length for the ultimate in fit, flair, performance and style. Extra-wide 4” integrated elastic waistband with added inset drawstring for a secure, no slip fit. Additional 4” leg slits provide increased mobility and peak results. Cut and crafted with additional room in the crotch to accommodate pro style and groin protectors. Fully machine washable.